This time-honored collection provides exceptional value, offering a broad array of items for well-equipped washrooms. 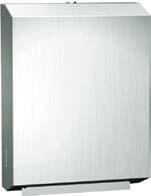 Double-pan doors incorporate a “no-flex” structural fiber board core. Combining seamless construction and crisp design lines, this elegant collection provides strength, comfort, beauty and durability. 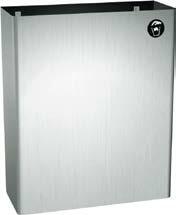 All units have keyed-alike tumbler locks for ease in maintenance. Automatic dispensers feature a proximity sensor activated dispensing mechanism. 0462-AD-9 Surface mounted with 9" stainless steel collar. 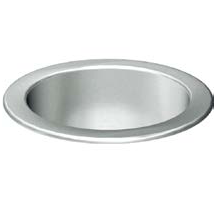 0469-2 Semi-recessed with 2" stainless steel collar. 0469-9 Surface mounted with 9" stainless steel collar. 0469-BL 18 gal. (68 L) waste receptacle. Projects 8" (205 mm) from wall. 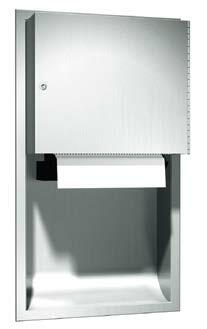 Dispenses 600 C-fold, 800 multi-fold or 1100 single-fold paper towels. 12 gal. 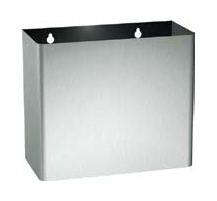 (46 L) stainless steel waste receptacle. 04697-4 Semi-recessed with 4" stainless steel collar. 04697-9 Surface mounted with 9" stainless steel collar. 04697-BL 18 gal. (68 L) waste receptacle, projects 4" (102 mm) from wall. Proximity sensing no-touch unit dispenses a pre-set length per cycle from 8" or 9" (205 or 230 mm) wide, 800 ft. (244 m) long rolls. 0467-2 Semi-recessed with 2" stainless steel collar. 0467-9 Surface mounted with 9" stainless steel collar. 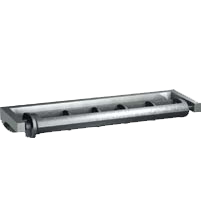 Dispenses single full width cut towel 12" (305 mm) long from pull-towel autocut dispenser. With manual override feed wheel on the side of the cabinet. Proximity sensing no-touch recessed unit dispenses a pre-set length per cycle from 8" or 9" (205 or 230 mm) wide, 800 ft. (244 m) long rolls. 12 gal. (45.4 L) waste receptacle. 0457-9 Surface mounted with 9" stainless steel collar. 0452-9 Surface mounted with 9" stainless steel collar. Pre-set length dispensed from 8" or 9" wide rolls. 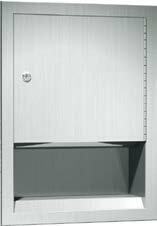 Stainless steel waste container locks into cabinet, removable for servicing. 0458-9 Surface mounted with 9" stainless steel collar. 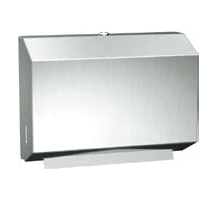 Fabricated of 22 gauge stainless steel with satin finish, this unit dispenses 400 C-fold or 525 multi-fold paper towels without adjustment or adapters and is fitted with tumbler lock and heavy-duty stainless steel piano hinge. 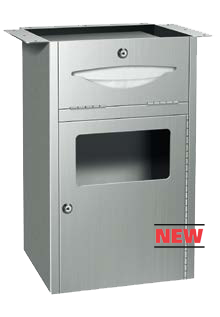 Same as 0210 but reduced capacity to dispense 200 C-fold or 275 multi-fold paper towels; well-suited for low traffic areas. 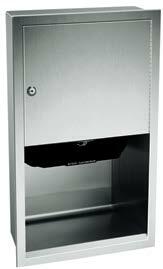 This cabinet has 2 push-up flaps for bottom-filling with towels and dispenses 600 C-fold or 800 multi-fold paper towels; designed to conceal the dispenser behind mirror or wall so only the towel tray opening is visible. *Note for Designers: Leave 6" min. 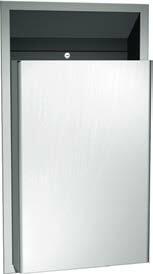 (152 mm) clearance below towel tray opening for space to pull towels; units are installed before hanging mirror or applying finished wall. Mechanical unit dispenses a pre-set length per cycle from 8" or 9" (205 or 230 mm) wide, 800 ft. (244 m) long rolls. 8523A Powered by 4 D-size batteries (not included). 8523AC Powered by AC plug-in adapter. 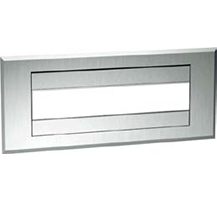 8523A-SR4 Semi-recessed with 4" stainless steel collar. 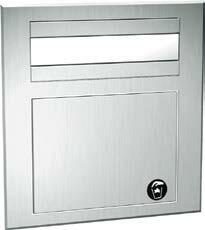 8523AC-SR4 Semi-recessed with 4" stainless steel collar. Holds standard paper towel roll up to 6" (150 mm) diameter; heavy-duty aluminum casting with satin-matte, silver-grey finish. 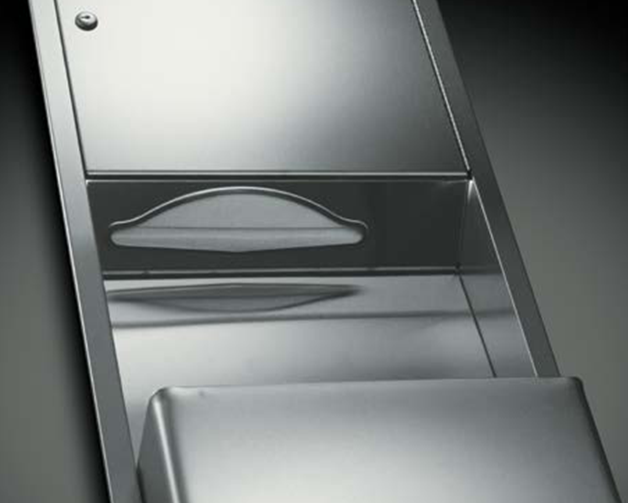 Designed for controlled delivery of towels, and its concealed locking device on molded plastic spindle prevents theft. Unit measures 13" (330 mm) wide; projects 4" (102 mm) from wall. Entirely fabricated of 22 gauge stainless steel. This unit dispenses 400 single-fold paper towels. 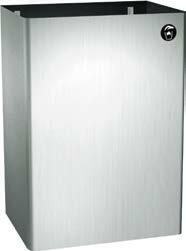 Fabricated of 22 gauge type 304 stainless steel with satin finish and hemmed top and bottom edges for safety; holds 6.7 gal. (25.4 L) of waste. 22 gauge stainless steel with satin finish; holds 17 gal. (64.4 L) with top and bottom hemmed edges; interior hooks for liner. 0826 has 12 gal. (45 L) capacity with 15¼" x 23" x 8" (387 x 584 x 203 mm) dimensions. 22 gauge stainless steel with satin finish; holds 14 gal. (54 L); self-closing doors on top with vinyl wall bumpers, rubber feet and hooks for liners. 0812 has 19 gal. 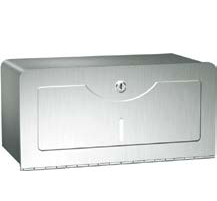 (72 L) capacity with 13" x 38½" x 12¼" (330 x 978 x 311 mm) dimensions. Same features as Model 0810 except without top. 0813 has 19 gal. (72 L) capacity with 13" x 30" x 12¼" (330 x 762 x 311 mm) dimensions. Fabricated of 22 gauge type 304 stainless steel with satin finish and hemmed top and bottom edges for safety; capacity of 2 gal. (7.6 L) of waste. 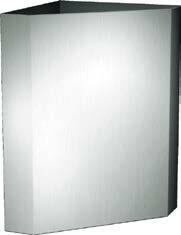 Fabricated of 22 gauge type 304 stainless steel with satin finish and hemmed top and bottom edges for safety; capacity of 15.5 gal. (59 L) of waste. 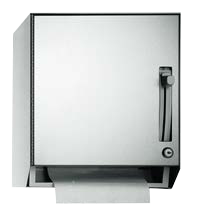 Dispenses 300 C-fold or 475 multi-fold paper towels and has a waste capacity of 10 gal. (38 L). Waste disposal door is spring loaded to remain shut. 1000A has a 9" (229 mm) outside diameter with a counter opening of 81⁄8" (206 mm) diameter. Capacity of 1 package of C-fold paper towels for loading by pushing through hinged dispensing flaps. 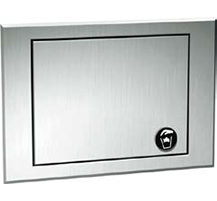 Loose waste receptacle to be placed directly below waste door on the vanity floor is provided. Capacity of 1 package of C-fold paper towels for loading by pushing downward through hinged dispensing flaps. 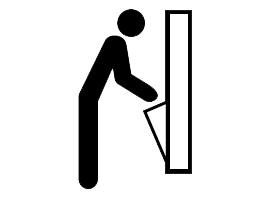 Push door is self-closing. 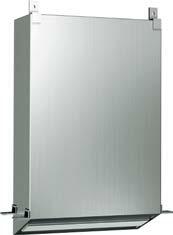 A 12" x 12" x 12" (305 x 305 x 305 mm) waste receptacle is furnished to be placed directly below waste door on the vanity floor.